The mission of the event is to increase funding and awareness for ECEF and help promote literacy in a fun environment. The vision is to create a neighborly, community focused atmosphere as a great way to end summer before the new school year begins. The event will also mark the first-time fireworks will be at the Reading Country Club. Some of the events from the 2 May Day Community Festival days that were rained out will also be incorporated into this event. • First ever Fireworks display over the RCC Castle! 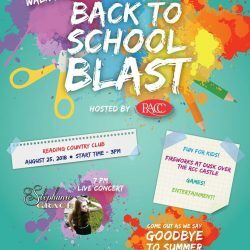 Registration begins at 3pm – Come register and all kids will receive a back to school sack and other giveaways thanks to Reading Area Community College. Once you register cost is only $5 which includes admission to the guided walk and entertainment. Please bring money for the various food trucks and other vendors that will be selling books and providing information. Walk will begin promptly at 4pm. Exeter Senior Abigail Henry will lead the walk this year. The Berks Hometown Hero Community Impact Award will be given on this night. This will go to the person who has and continues to make a positive impact on the community and in helping others. Local Talent Stephanie Grace will give a high energy concert on the driving range at 7pm. Come out and see this phenomenal star perform for the 1st time ever at the RCC. Amazing and talented groups from Turning Pointe Dance Studio, Thunderbolt Production Group and one of the 1st performances of the year by the National Champion Exeter Township Cheerleaders will also be on hand. Fireworks at 9:15pm – Grab your spot to see and be part of history as we will light up the sky as part of our Back to School Blast! Fireworks over the RCC Castle for the 1st time ever courtesy of Reiffton Social Quarters. The Berks Hometown Heroes Board is exited to present this event for the Exeter and surrounding Communities. Now in its 2nd year, we see this as a great community driven and community focused event to help promote an important cause and have some fun while doing it. Let’s blast into a successful school year. We hope to see you there!